Virginia Beach Rental - Timeshare Tips BEFORE You Buy! Considering a Virginia Beach rental timeshare? The word "timeshare" stirs up conflicting images. Some people swear by them. Others wouldn't touch 'em with a ten-foot pole. We've put together some tips you should consider before taking the plunge. 1. Don't buy timeshares as investments - You may THINK they'll appreciate in value or be rented continually, but don't count on it! Only buy a timeshare if you plan to use it in the future yourself. 2. Pick a time share location that you will enjoy not only now but in the future. For example, while you might buy one in Las Vegas now for a visit this summer. But if you never intend on going there again, but by that timeshare because it's relatively inexpensive and you think you'll be able to exchange it for a timeshare in Hawaii, don't count on it. 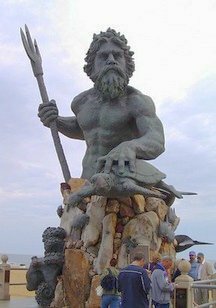 The King Neptune statue on the Virginia Beach Boardwalk is nearby some great timeshare locations. 3. Do be sure you make a stay at a specific timeshare or Virginia Beach rental before you actually purchase the timeshare. You may think that all timeshares are like, but there is no substitute for actually staying in a place. You may also want to consider talking to other existing owners to see how they like the place before you buy it. 4. Do ask if the timeshare resort is a member of a ARDA. Such members have to adhere to the ARDA code of standards and ethics, which protects you. 5. Make sure you read all the documents very carefully so you know what you're getting into. You might want to consider consulting a lawyer or someone with experience with timeshares before buying. 6. Ask yourself these questions: Is the property in good shape and carefully maintained? What do you think of the staff? As ARDA says, "choosing a timeshare is kind of like choosing a spouse." 7. If you are hoping to exchange your timeshare for another down the road, the ARDA recommends that you buy the most desirable unit at the timeshare at the high season of the year, and for the largest points package that you think that you can afford now. That will give you the best chance for exchanging for something preferable down the road. 8. Is the resort affiliated with an exchange company? Don't assume. 9. Last, are you sure it's really a timeshare? Again, don't assume! If so, it will be registered as one under state timeshare laws. Looking for a Virginia Beach Rental or Timeshare? A Williamsburg timeshare is a great starting point for visiting Shirley Plantation. Gold Key Vacations - Probably the best known timeshare agency specializing in Virginia Beach timeshares. 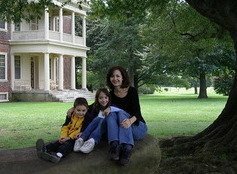 *They also specialize in timeshares near Busch Gardens Williamsburg and Colonial Williamsburg.